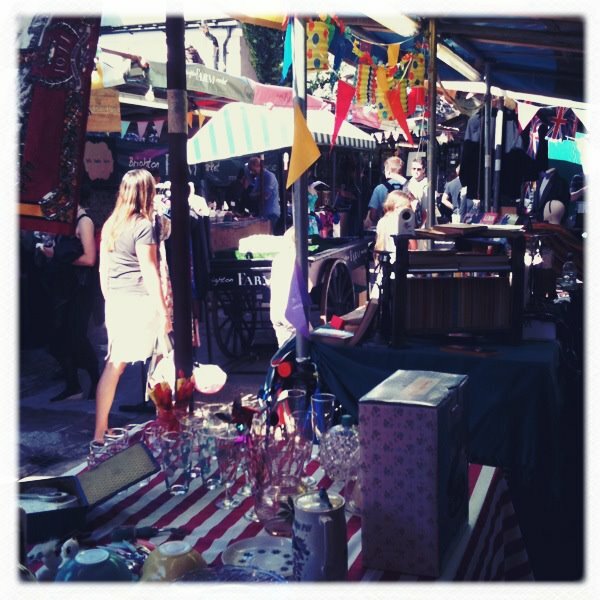 Sunday June 28th – Still trying to fill the Sunday morning browsing gap left by the relocation of our beloved boot fair it was fun checking out the one day flea market down at Phoenix Brighton. This summer bazaar brought together a variety of affordable art and jewellery made by local artists as well an eclectic mix of stalls selling books, badges, buttons an’ bows and all things arty and junkalicious in between. With loads of interesting stalls to look through, some yummy home made refreshments on offer and all indoors so sheltered from the British summer, this ticked all the right boxes in the rummaging stakes. Best buy was this beautiful bracelet made by Lux & Love. Check out her web page for more precious jewels, voodoo gems, vintage and reclaimed jewellery. And speaking of all things gorgeously Mexican, Voodoo and Gothic, check out Brighton artist Mahni Dare’s awesome props, puppetry and much more at Mahni-Monsta.com.